Well I got one. Can't wait. 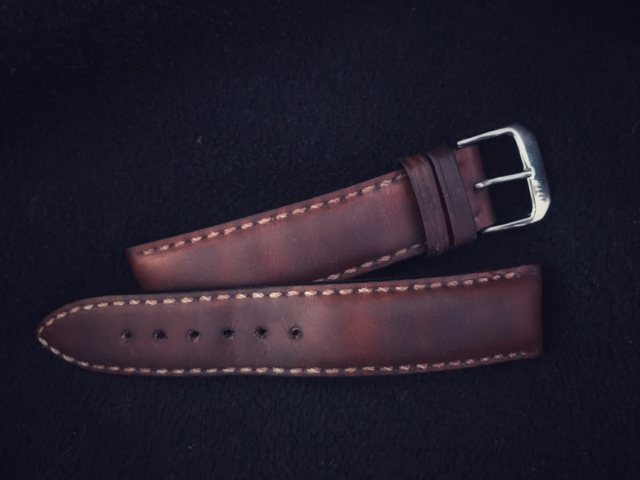 The leather strap I want it on (WatchGecko Otley in brown with white stitching) is out of stock in 20mm at the moment but a couple of NATOs are waiting. Quite looking forward to wearing it on the bracelet, though, precisely because so few of my watches have them. Thanks for doing this 36mm version, Eddie. Not been this excited about a watch in a long time, if ever. Just got to work 7am EST and was way too late. Maybe next month. By then though the Speedbird will be on my mind too. Yup got to work 7:30am eastern US time and too late. Oh well. Its a Jan xmas present for me then. Last edited by Faide; 18th December 2018 at 13:54. Just checking out my old Rhino... on the 40mm. So excited! I've been following the old discussion thread and finally got into my first time factors watch with the 36mm. Cleaned, treated with RM Williams leather conditioner, ready to go on, until I decide whether to keep it or my original . . .
Last edited by magirus; 19th December 2018 at 12:10. Thanks Eddie for making these wonderful, affordable watches. Last edited by DannyPN; 19th December 2018 at 14:24. There's a slim chance I could receive the PRS-45 by the end of December. 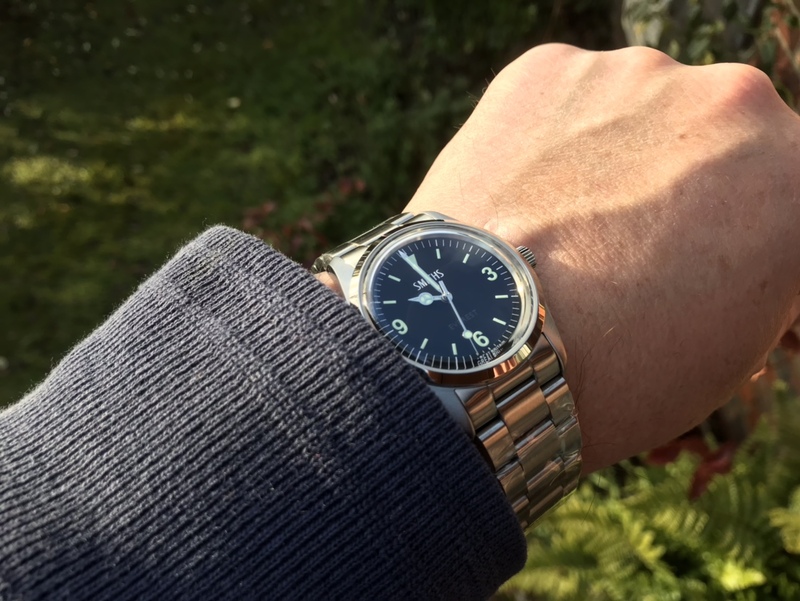 face 36mm Everest , when released, having managed not to succumb to the black 36mm! and are stunning to boot! My advice is to buy them all. You'll only be sorry when they're sold out and discontinued. You can thank me later. 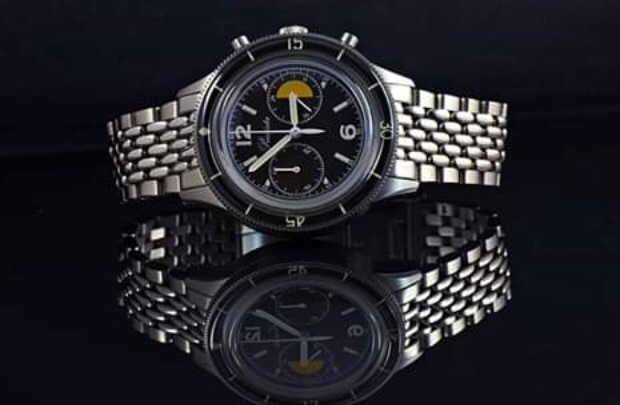 What is the one called that is the Chrono version of the PRS-40? Last edited by redhed18; 19th December 2018 at 14:56. Beautiful piece. Any more closeups? 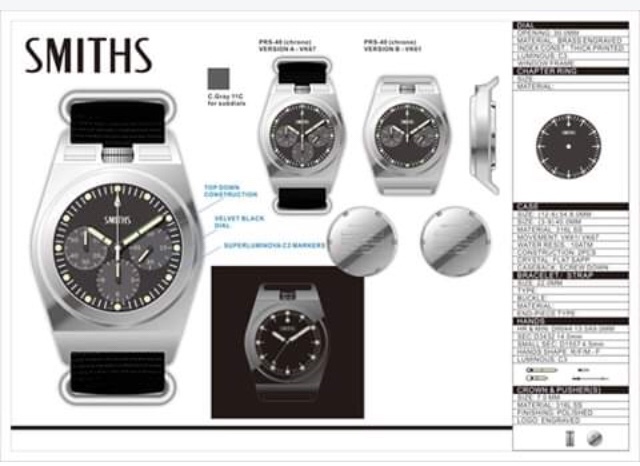 It looks from your pics like the minute hand is actually shorter than it appeared in Eddie's pics on the website. Last edited by acg2010; 19th December 2018 at 14:52. 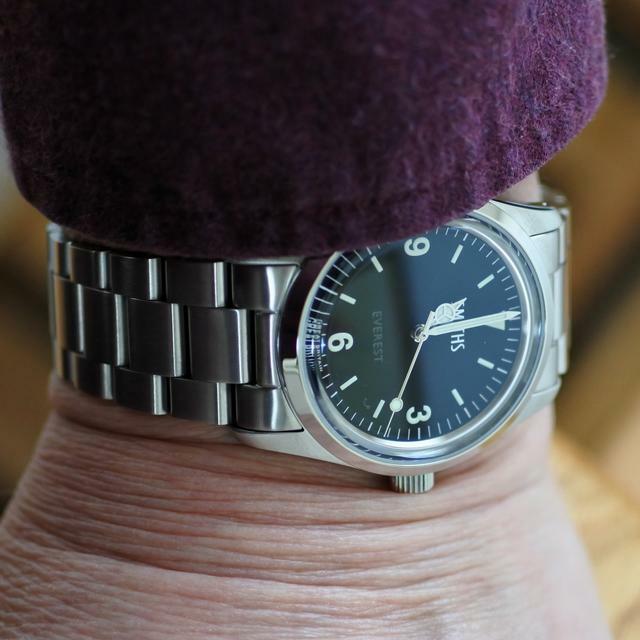 Finally, a wrist shot! Looks excellent, can't wait. Congrats. A lot of envious people looking out for the overloaded Posties. Eddie did day he’d post all the overseas ones first in the hope that everyone received them before Christmas. Just got my dispatch notice, so Eddie must have cleared the international orders and started on the UK ones. He must be working so hard. He should really get some elves in to help at times like this. Can't be easy being a one man band. All the international ones have now been shipped and 15 for delivery in the UK tomorrow. Funny old split: 22 international, 44 UK. No, Eddie's pics are accurate. I'm just a crappy photographer with a crappy iphone. I'm really enjoying the watch. Incredible quality for the money. I've got some leather straps coming from Italy, should get them tomorrow hopefully. Once I have them I'll post some pics of the watch on leather. Good to see people still have an eye for a quality watch for a decent price. HA - that tickled me, good spot! I have also to pulled the trigger on one of those bad boys. 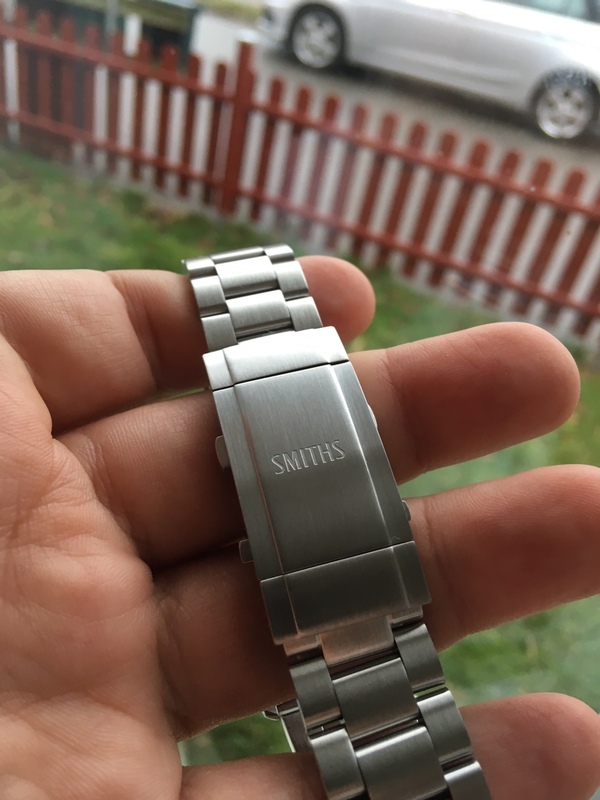 I had a bit of trouble with my card, so I hope the order has gone through OK.
My only reservation is the size of the new clasp relative to the watch head. But tbh I have already ordered fresh boots for this bad boy, as I'm not really a bracelet kind of a guy. I had really hoped that the prs45 would be released in time for Christmas, but fate declared that this was not to be. 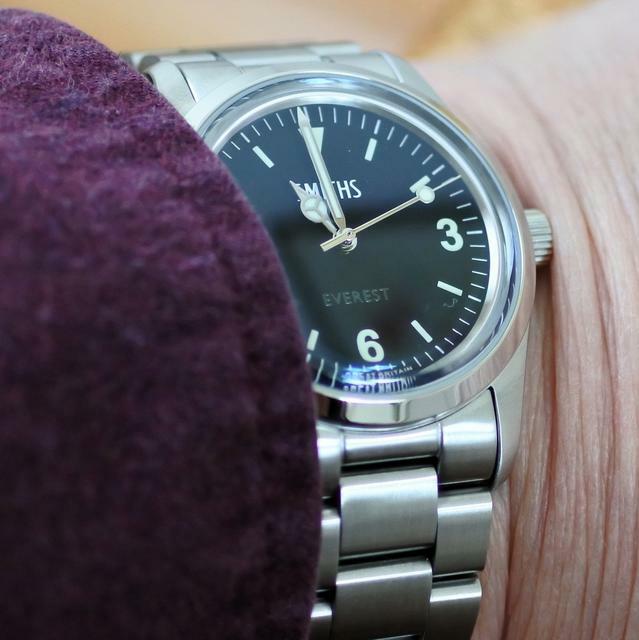 I had one of the previous Everest and really like the simplicity of the watch - it was just too big however for my liking. 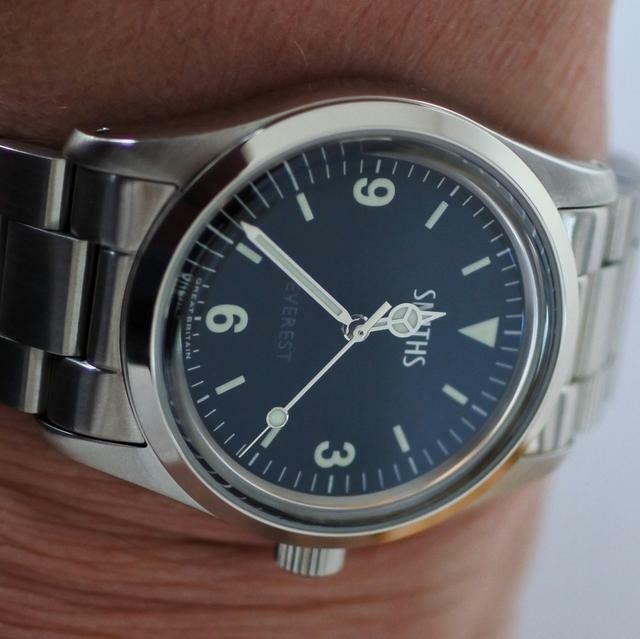 I'm pretty excited about this one tbh, and that's coming from someone with a somewhat jaded horological palate. Thanks Eddie and good luck with all the processing. Have a nice Christmas everyone. PRS-40C? This is the one that's getting me excited. Still would like an original version again though. UPS sent a message with a delivery notice for tomorrow. Happy days and quite impressive to get the watch so fast to Sweden. A bit disappointing to see Eddie posting here when he should be hard at it. I have a delivery notice for tomorrow for Canada! UPS (and Eddie) are impressive, no question! Just received UPS notice stating that arriving tomorrow Fri 21 DEC in Sydney ! Impressive - Many thanks Eddie. Yeah I should also have a package in Canada tomorrow (the 20th...) and it’s impressive how fast they shift it. But for (iirc) £35 shipping, they better! Now to see what kind of duty & taxes we get hammered with. At least some Erika’s straps arrived today under the radar. Got it! Thanks Eddie and all the members for their contributions. Now my PRS-22 will be in good company! Just got the mail from Eddie to say mine has been dispatched, can't wait! Levels of excitement for this watch are skyrocketing! 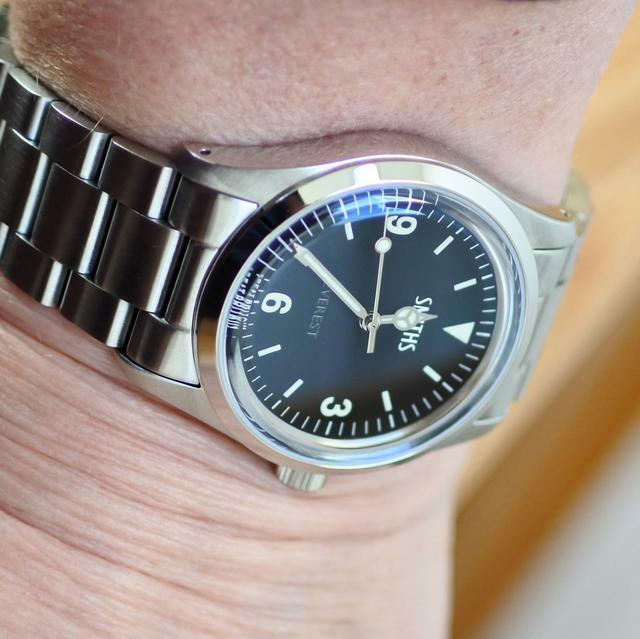 The wrist shots above look great, any chance of some with the clasp? Hopefully I'll have mine in time to post on the Friday thread tomorrow. Thanks again to Eddie for fantastic speed of service, my first purchase with you but won't be the last! For reference, my wrist is about 7" in circumference. I took out 3 links and the extendable clasp is unextended. 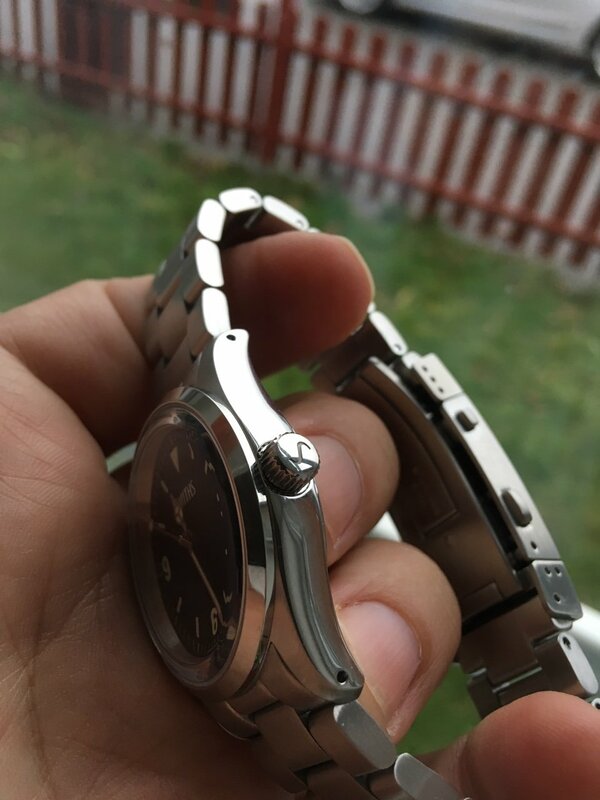 As I expected (as I have a Citizen 'Excalibur' dive watch with a similar fitting) the clasp is thicker than you want really, especially on a smaller watch like this, and I think a lot of people would probably have preferred a standard clasp with a taper to 16 mm on the bracelet. Then again these extendable clasps are a real boon on hot days. A lot of people will prefer to wear it on a leather strap anyway. 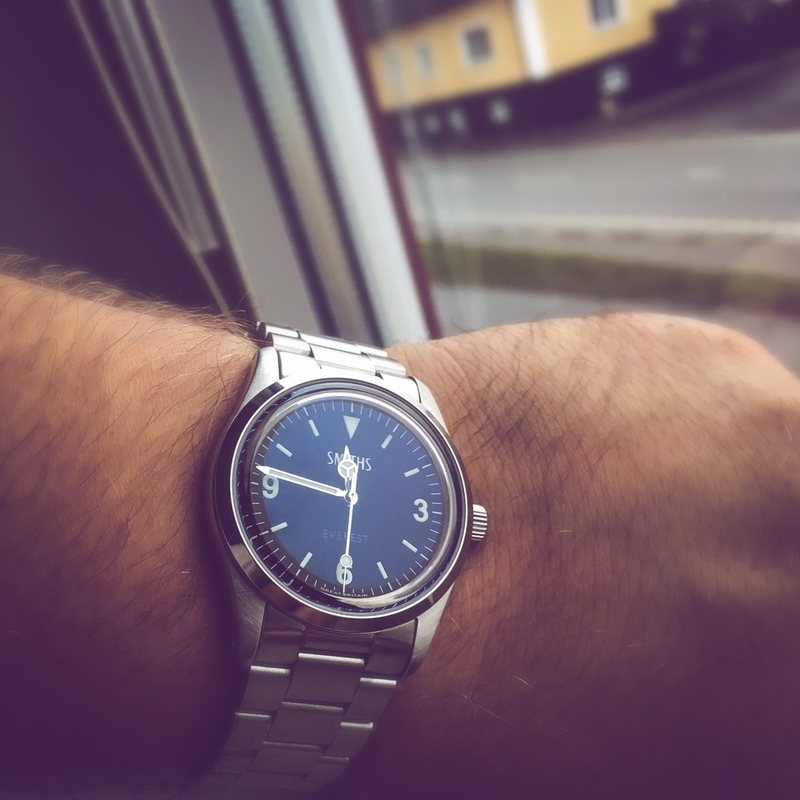 Thanks for the pics and compliment, it is a beautiful watch ! 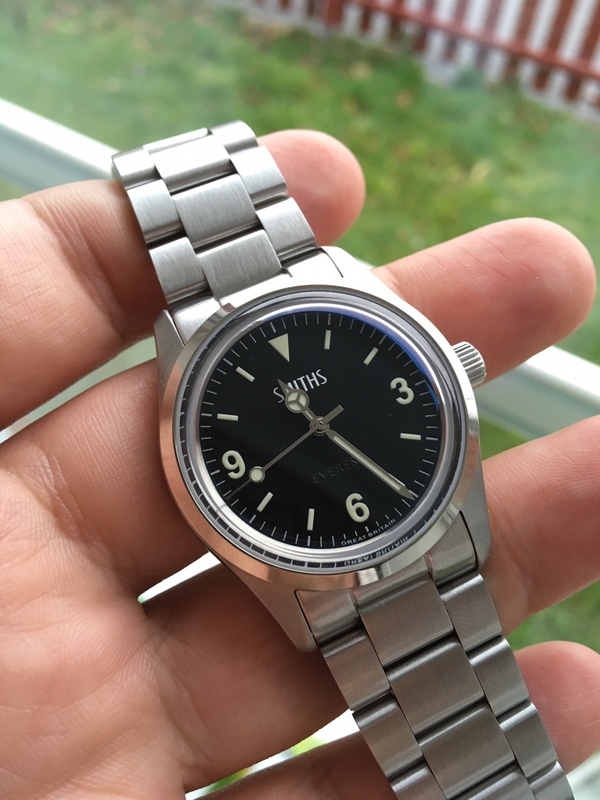 I believe I'll jump on it on early 2019 (when new funds will be available ...) and I fully agree with you, this 36mm Everest deserves a bracelet tapering from 20 to 16mm with simple "old style" clasp, like the one on the Baltic watch here below just as an example. Mine just arrived. 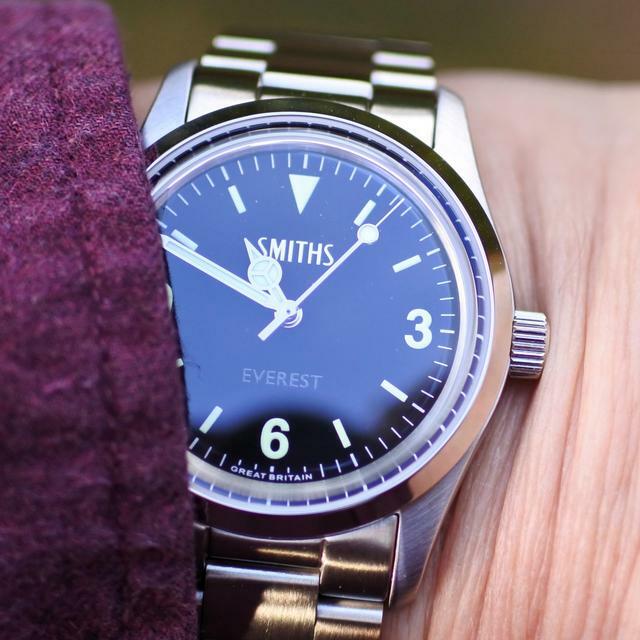 First impression: the Smiths 36mm Everest utterly destroys any reason one could advance for spending £2k on a Black Bay 36. Incredibly pretty, beautifully made, lovely weight to it. It’s astonishing what Eddie has achieved for the price. Not massively keen on the clasp, but I didn’t expect to be. 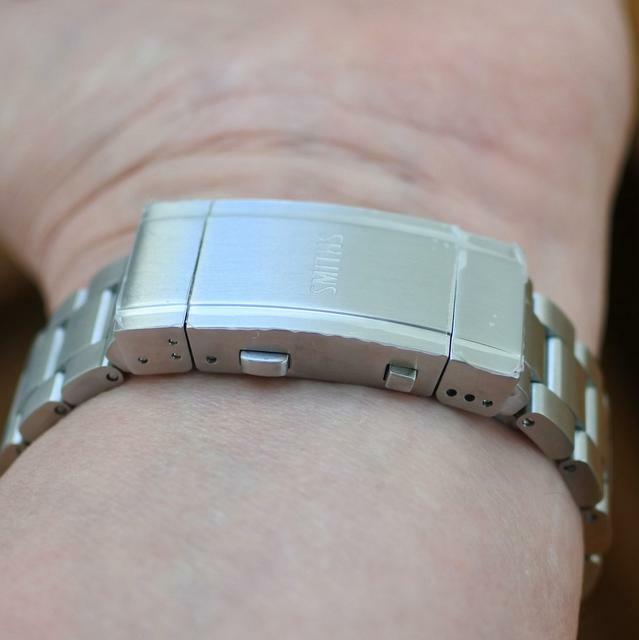 It’s too bulky for a 36mm watch, I feel. I’ll be picking up one of the later rivet bracelets for it if they become available separately. For now I’ve got it on an Erika’s MN strap, and I’ll be enjoying trying it on different strap options over Christmas and new year. Congrats Eddie, it’s a real winner. ^^^^ Great pics. Mine’s going on leather or NATO. Can’t wait!